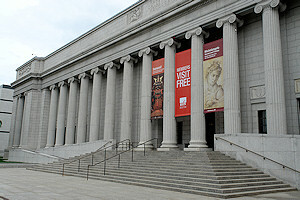 The Museum of Fine Arts, Boston, is one of the most comprehensive art museums in the world, with a collection that encompasses nearly 450,000 works of art. The museum welcomes over a million visitors each year, including numerous schoolchildren, who experience art from ancient Egyptian to contemporary, along with special exhibitions, and innovative educational programs. 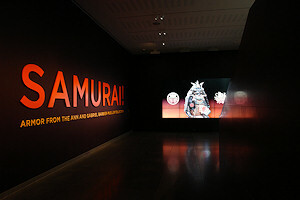 Recently, the museum hosted the spectacular exhibition “Samurai! Armor from the Ann and Gabriel Barbier-Mueller Collection” featuring more than 140 objects illuminating the life, culture, and pageantry of these revered and feared Japanese warriors—from one of the best and largest collections in the world. 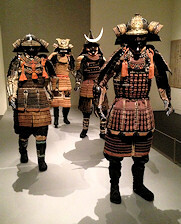 Highlights included helmets of lacquered metal adorned with emblems often inspired by nature—which signaled the status of the wearer, differentiated samurai from each other, and also frightened the enemy on the battlefield—and full suits of exquisitely crafted armor, weapons, horse armor, and accoutrements used for both battle and ceremonies. The exhibit showcased 21 full suits of armor, including one formerly owned by the Yoshiki branch of the Mōri clan, a prominent family whose origins date to 12th century Japan. 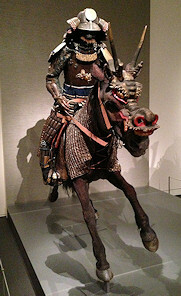 Three life-size horses clad in armor illustrated the pageantry of samurai and their mounts in battle or procession. The history of the samurai begins in 792, when Japan ended its policy of conscripting troops. This led provincial landowners to assemble their own forces for defense, giving rise to the samurai class. By 1185, warlords became the military elite, ruling in the name of the emperor. Leading them was a shogun, commander of the most powerful family or clan. Under him were daimyo, heads of other families, who were served by samurai warriors. Through the centuries different clans vied for power. However, in 1603, Tokugawa Ieyasu became shogun and established a lasting peace that extended some 250 years (Edo period, 1615–1868). During the subsequent Meiji Restoration in 1868, the emperor reasserted his authority as supreme ruler and the samurai as an official elite class was dissolved. Over the course of their long rule, the samurai clans marshaled legions of formidable warriors who cut down their enemies on foot and horseback on the battlefield. To protect the infantry and mounted samurai, armor became increasingly complex and varied, depending on its use and the status of the wearer. It also developed into an intricately designed work of art that served as a symbol of protection, ceremony, and prestige. Creating samurai armor was a highly specialized art form overseen by an armorer, who recruited a team of blacksmiths, softmetal (gold and copper) craftsmen, leather workers, braid makers, dyers, painters, and other artisans. The armor they produced protected the wearer and incorporated motifs reflecting samurai spirituality, folklore, and nature. Nine main schools were established, and in the Edo period (1615–1868), armorers were elevated to the rank of artists. The Myōchin school, which is well represented in the Barbier-Mueller collection, still exists and has been maintained by the same family for generations. Armor was crafted depending on whether the samurai fought on foot or horseback and what types of weapons were in use at the time. Spears, arrows with quivers, swords, and a matchlock gun are on view in the exhibition. Until the end of the Kamakura period (1185–1333), bows and arrows were the samurai’s primary weapons. During the Nanbokchō and Muromachi periods (1333–1392 and 1392–1568), more battles requiring hand-to-hand combat made lances and swords the more effective weapons of choice until the introduction of the matchlock gun in 1543 by “southern barbarians” (nanban), Portuguese mariners who brought firearms with them when they landed in southern Japan. Their influence, and that of the Dutch, can be seen in a variety of masks and helmets in the exhibition. European army equipment eventually impacted the styles of Japanese armor, and construction had to adapt to protect against the new weapon introduced by the Portuguese. 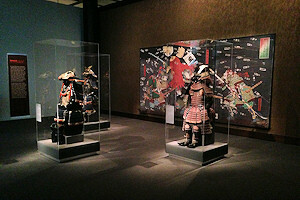 The spectacle of high-ranking samurai dressed in full regalia for battle, procession, and ceremony comes to life in a display of three warriors on horseback. Of particular note is armor of the tatehagidō type (early Edo period, 17th century), shown with horse armor (bagai), a horse mask (bamen), and horse tack (bagu, early to mid-Edo period, 17th–18th century). Horse armor was made of small tiles of pressed leather lacquered in gold and sewn onto cloth. A mask crafted of boiled leather that was shaped and lacquered to represent a stylized horse or dragon protected the horse’s head. The saddle was made of lacquered, decorated, or inlaid hardwoods, and saddle pads protected the horse from the heavy metal stirrups. The samurai were accomplished mounted archers, outfitting their horses with wide stirrups made of iron, wood, and copper or silver; these served as sturdy platforms on which the archers could stand and shoot. Before the 17th century, samurai horses did not wear armor. Subsequently, the armoring of horses conveyed the prestige and power of their owners during ceremonies that paid tribute to highranking leaders or marked special occasions. When not in use, samurai armor would be showcased for guests to see in the shoin, or special reception room of a daimyo’s home, on the 11th day of the first month of each year. A highlight of Samurai! is the presentation of helmets and suits of armor not only as symbols of power and authority, but also as beautiful works of art. Exquisitely decorated helmets, such as Flame helmet (kaen kabuto) representing the flaming jewel (hōju no tama, early Edo period, about 1630), appear in a dramatically lit, jewel-box display, one of numerous helmets adorned with fanciful shapes, including horns, shells, bamboo, and Buddhist iconography. To fully appreciate the world of the samurai, the exhibition also introduced visitors to bushidō, the “way of the warrior.” This code of conduct incorporated martial and ethical traditions, including honesty, courage, honor, and loyalty, as well as the warrior’s acceptance of death, either at the hand of the enemy in battle, or through ritual suicide should he break the code.